How did Norway acquire a highly developed, easy to use database for charging stations, capable of real-time updates on availability, ready to be adopted by any interested country? Norway had the EVs on the road, and while the national charging infrastructure was being built in 2009-2010, questions arose on how to maximize the benefit from it. The answer was to collect all the information in a central database, and distribute it with the goal to increase knowledge about the availability of charging infrastructure for electric vehicles. This makes it easier to be an EV-user. And the result will be more EV-users. Cooperation between the governmental entity Enova and the Norwegian Electric Vehicle Association resulted in the development of an open, publicly owned database that allows everyone to build services using standardized data free of charge. NOBIL is developed and maintained by the Norwegian Electric Vehicle Association. Information is collected from EV-users, charging stations owners and operators and other contributors. Collection and verification of data is prioritized to secure accurate and reliable information for EV-users in need of electricity. A strategic decision was to ensure public ownership of the database to make the content available for everyone. Therefore NOBIL is financed and owned by Enova. NOBIL is built with non-proprietary software tools, includes detailed information about charging stations and receives and distributes real-time data. Key data, including practical and technical information, accessibility for users, type of connectors and charging capacity, map coordinates, and pictures, are available for the general public. The database will be continuously expanded as new charging stations are built. NOBIL covers the Norwegian charging infrastructure very well and includes around 1,400 charging stations with over 5,000 charging points, whereof 60 are fast chargers. NOBIL's role is to gather information and communicate it effectively to third parties. NOBIL is not instrumental for operations (booking and payment), only for the collection and reporting of data. We do not interfere into the business of the operators and owners of the charging stations. We have made a distinction between the database and the services built on top of it. The EV-users and Enova take responsibility for the collection of charging station data, verification and making it available to everyone. 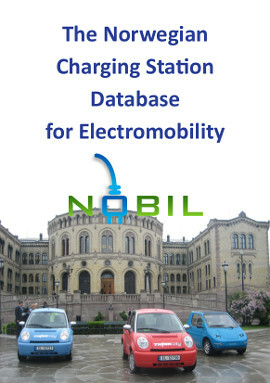 It is up to the market to develop services using charging station data from NOBIL. 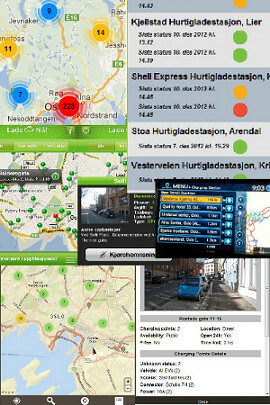 Services the EV-users utilize in everyday life, whether the information is on web, in mobile apps or inside the navigation of the electric cars. 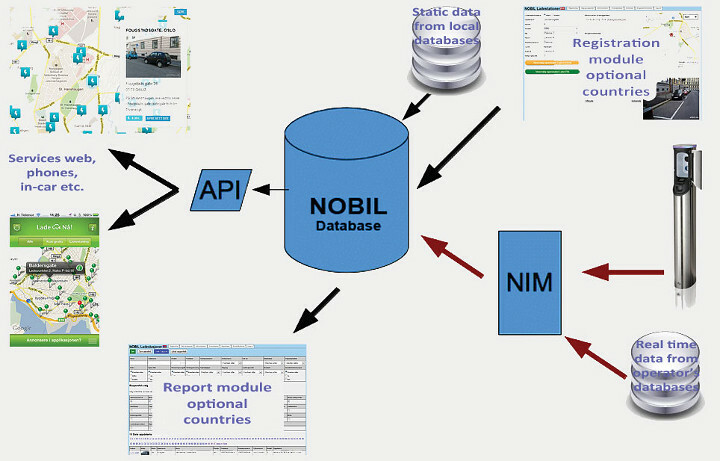 Data from NOBIL is freely available through an API (application programming interface). Simply register as an API-user and accept the terms of free use (Creative Commons). In return you will have the API-key for access sent. You can read more about the API here and download the documentation. In 2012 the database underwent major improvements to prepare it for fast chargers and real-time updates. The close ties between the Nordic countries have generated a project set to expand the database for Nordic use. Other interested countries can adopt the database, with the requirement that they provide non-discriminatory data registration of publicly accessible chargers for their country. Non-polluting electric vehicles powered by renewable energy. NOBIL’s charging stations are paving the way for cities free of noise and fumes. cutting of CO2 emissions to curb climate change. avoiding the injurious health effects of air and noise pollution caused by steadily increasing levels of traffic in our cities. phasing in of electric vehicles (EVs) to achieve greater energy efficiency and to increase the use of renewable energy. There are great challenges to be met. One of the key measures is providing an adequate charging infrastructure for energy-efficient, emission-free EVs. Access to charging stations can compensate for the shorter driving distance, allowing many more of us to choose non-polluting EVs. Electrification of road transport is a sign that we are leaving the oil age and heading into an era in which renewable energy sources will transform our cars into «perpetual motion machines», powered by the wind that blows, the rivers that run, the sun that shines and the waves that beat against our shores. Our cities will be alive, free of noise and fumes. Norway is the country with the greatest number of electric cars in relation to its population. Using renewable energy to charge them puts us in the lead environmentally. Norway currently has the most extensive infrastructure of charging stations, as well. And through NOBIL, we are leading the field in documentation and information about these charging stations. Kopirett © 2019 NOBIL.no. Alle rettigheter reservert.